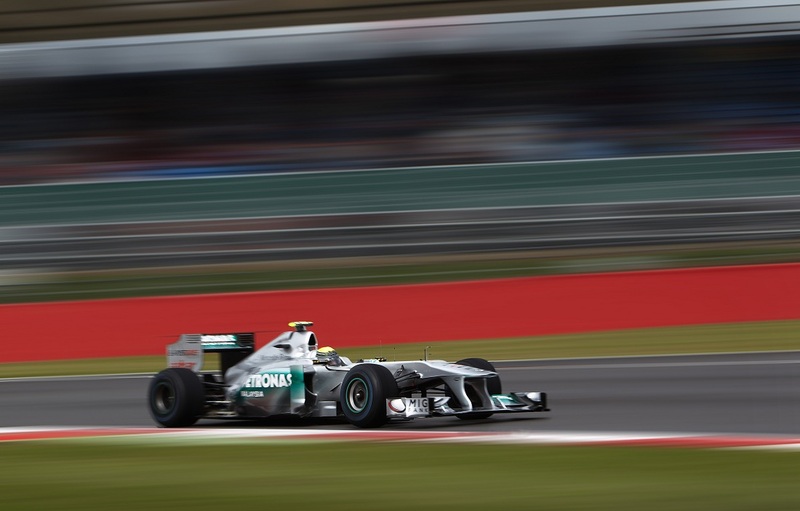 Similar to what Charlotte Motor Speedway is to NASCAR and what the Indianapolis Motor Speedway is to INDYCAR, the Silverstone circuit is the port of call for many of the team participating in the Formula 1 series. with race shops near the track, the British Grand Prix is a homecoming of sorts for this very international series. Practicing under cloudy skies with sprays of precipitation on the historic 3.667-mile track, the formula 1 drivers and teams were looking past Friday to see more of the same weather conditions. Saturday's qualifying for the Formula 1 series found competitors with one eye on the track and another on the skies. Timing their qualifying run with precision to the changing weather conditions, the Red Bull Racing team emerges from British Grand Prix qualifying taking the front row spots. Beating his championship-leading teammate for only the second time in 2011 qualifying, Australia's Mark Webber delivered a top time just before the track conditions would become too damp. Setting a new track record with a 1 minute, 30.399 second in qualifying on the current Arena track configuration, Webber defends his Red Bull Racing team's current undefeated record for grand prix poles for 2011. Sebastian Vettel grabbed second place in a qualifying where the German show less race dominating pace. Perhaps affected by new Formula 1 rules which was said to have punished the Red Bull-Renaults, Vettel would not lead a single session of British Grand Prix qualifying session. As the Red Bull-Renaults appeared to be normalized to other top Formula 1 contenders, the Scuderia Ferrari cars driven by Fernando Alonso and Felipe Massa found all-new energy through the time trial. In the Q2 round, the Ferrari of Massa currently posted the top time over the Red Bull-Renaults. In the final round, Alonso found some additional speed to pass some Ferrari teammate concluding with a second row team sweep. In the third row, Jenson Button posted more than acceptable time with his McLaren-Mercedes. Button's teammate Lewis Hamilton will start 10th as the slowest vehicle in the Q3 group. Providing a surprising companion to the 2009 Formula 1 world champion in the third row is Paul di Resta. Driving one of the Force India race cars powered by customer Mercedes-Benz engines, the rookie starts 6th at Silverstone.